We were approached by a groom who wanted to surprise his bride when they arrived at a Hertfordshire-based hotel following their wedding reception. The groom didn’t have anything specific in mind, he just wanted to end the evening in style with something that would surprise his wife when she thought all of the excitement for the day was over. The obvious choice for a wedding finale is a Firework Display. However, UK law states that fireworks cannot be fired after 23:00 (except on five specific dates like New Years Eve etc) due to the noise pollution. With the expected arrival time at the hotel around 23:30, a firework display had to be ruled out. 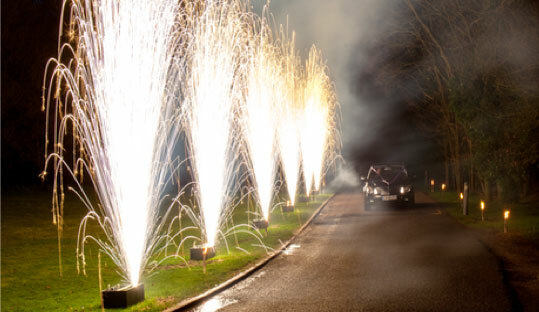 Instead, our expert team opted for a quick Pyro Special Effect, lining the entrance driveway to the hotel with some long duration Gerb Fountains. The chauffeur was briefed to drive slowly and as he drew level with the first position the products were fired. Out of the darkness, huge plumes of golden sparks burst from the ground to create a beautiful wall of light which burned for the duration of the final approach to the hotel. 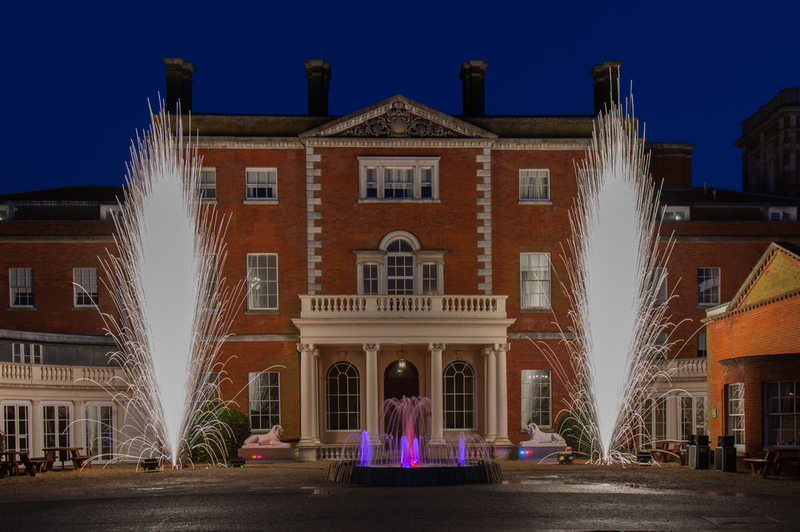 As the car reached the front of the hotel, another single burst of pyrotechnics either side of the entrance was fired to illuminate the beautiful hotel.